I was lucky enough to get an excellent day's gaming in yesterday with Luke and Pat up at Luke's new pad in Hyogo. Things though didn't start too well - I overslept, missed the train, and had to drive there to make up time. Fortunately, the car navi did what it says on the tin and helped me thread my way through the traffic hell of Osaka; less fortunately the rush to get moving meant that I completely forgot to take up my sea cloth and a book I needed to return to our host. Anyway, I got there about 10:00, and when Pat arrived shortly afterwards we began looking at fleets for some Naval Thunder action. We decided on early Pacific war, so Luke and I made up an augmented Force Z (Prince of Wales, Perth, Arrow and Ardent for me; Repulse, Houston, Shark and Scourge for Luke) while Pat worked out his IJN contingent. I'm not sure what the exact composition of the Japanese force was, but there were two battle cruisers (Nagato and Hiei), a couple of light cruisers (Jintsu and Furutaka) and three or four destroyers. It began badly for us as Nagato found her mark early and pounded an outranged Repulse, taking her apart turn by turn. Prince of Wales closed to firing distance but found hits initially hard to come by. Houston engaged the Japanese light cruisers who took damage. A menacing lot of Japanese vessels! Fine aggressive work by Japanese destroyers distracted Perth and Prince of Wales long enough and well enough to prevent closing of the range to concentrate fire on the Nagato while she was busy finishing off Repulse. Japanese destroyers close in to torpedo range. They wrong-footed my destroyer screen and gave Perth and Prince of Wales a scare. By the time Nagato was listing and removing herself back out to her extreme range we had lost Repulse, Houston was effectively dead in the water, and Scourge and Shark had been hunted down by secondary-battery fire. Jintsu and Furutaka were Japanese casualties, but Hiei and Nagato were together able to outgun Prince of Wales, and although she traded fire gallantly, once critical hits put two main gun turrets out of action the game was very clearly up. So, lots of fun, some great moments of drama, and some good play by Pat to win with the Japanese. There were a few things about the rules we might want to adjust, but they gave us an excellent four hours of play. Pat and I were playing for the second time and Luke for his first, but we were running the charts like veterans within a couple of turns. To finish the day we gave the boardgame Conquest of Paradise a go. We managed to play it to conclusion in about 90 minutes, despite Luke and Pat having to learn the rules on the fly, so it was a good way to end the day. So, good gaming, good company and fine hospitality. A great day all round. There's been an unexpected treat this week. A public holiday tomorrow and some hurried communication with Luke and Pat has seen a game of Naval Thunder organised up at Luke's new pad in Hyogo. In preparation I've just finished applying magnetic backing to all my recently painted ships, stowed them into a biscuit tin, rummaged through my board game collection to find d10s, and worked out the various trains I need to catch to get there at a time which will allow us a decent amount of gaming. After all that it's 2:45am and I'm enjoying the chance to have a quiet whiskey and dry before bed. It's been a long time since I've been up to Luke's. It's probably two, even three years. I think the last time was for an epic game of Modern Spearhead, so it should be great fun. I must confess though to not particularly looking forward to 3hrs 30mins on trains and buses each way! Once I see where he is I think in future I might drive up! Coin issued by Metellus Scipio. From the Roman Numismatics website. Last night I played through another Thapsus (46 BC) refight, this time a 'Caesar Incapacitated' scenario (check the bottom of this post if you want to see scenario details, troop numbers, etc), which follows Plutarch's report that there was a suggestion Caesar that had taken a turn before the battle, and that this had rendered him unable to command the army. Command duties have therefore been assumed by Caesar's staff. Both sides are surprised. This means that the armies start undeployed and can bring on to the table a maximum of four units per turn, with elephants and heavy infantry counting as two units on the first turn. Action begins with Metellus Scipio's men in the process of building a camp. Guarding its construction is a screen of elephants, light infantry, and Numidian light horse. Caesar's men advance with light infantry and veteran legionaries to clear the way for an assault on the half-completed fortification. Seeing that an attack is underway, Scipio hastily musters more elephants and legionaries to support his forward troops. Caesarian legionaries arrive on the scene en masse. Scipio shores up the centre and brings up more cavalry reinforcements for his left. The Caesarian slingers drive off the elephants and light infantry and the legates continue forming the legionaries into line. Scipio brings on his right wing, pushes the centre forward, and advances his light cavalry into contact on the left. The Caesarians advance forward on their left and on the right bring up the cavalry to counter the Numidian horse. The cavalry charges cause casualties on both sides, but the Numidian light horse break first. Although the Caesarians advance on the left, a command mix up means the centre is left behind. The Caesarian centre lags behind. Scipio's centre takes advantage of the communication breakdown to hit the inside flank of the Caesarian left. The elephants cause tremendous damage. The Caesarian centre does advance this time, but the left is under extreme pressure. The elephants continue their attack on the Caesarian left, forcing the veteran legionaries to retreat after having taken 50% casualties. On the other wing the cavalry fight continues. The horse of both sides are shaken, but the Optimates are able to feed fresh cavalry into the fight. The fresh reinforcements tell, and Scipio's heavy cavalry routs Caesar's Gauls and Spanish. Everywhere Caesar's line is under pressure. Again the elephants do awful damage to the Caesarian legionaries, this time in the centre. Scipio's cavalry drives two units of Caesar's veterans from the field in a glorious charge! The elephant attacks again prove unstoppable and with half of the Caesarian army gone, their right flank defeated and enemy cavalry in their rear, the Caesarians flee in an effort to make it back to the safety of their camp. And Caesar's absence is decisive: Metellus Scipio has won an incredible victory by 115 points to 36. An absolute humiliation for Caesar. His men are in a terrible way and if Scipio and Juba follow up as they should, it is probably the end of Caesar's African campaign. This scenario did not turn out at all as the battle is attested to have in The African War, but it did make for a tense and interesting battle. Caesarian command rolls were abysmal, and this allied with a very strong performance from Scipio's elephants and cavalry just blew the Caesarians away. The second Thapsus scenario is 'Caesar incapacitated' and mixes Plutarch's report that Caesar may have had a medical incident prior to the battle with Cassius Dio's hasty attack scenario. The battlefield is oriented roughly west/east with Scipio coming from the west (top of the board) and Caesar from the east. Ground scale is 600m per zone. The flank zones on both sides of the battlefield are treated as coastline (sea to the north; inland salt lake/lagoon to the south). There is a fortified camp in Scipio's left rear zone. Scipio's key zone is left centre (in front of the camp). Caesar's is currently right centre, but I'm not 100% settled on this. The attack limit is 3. 10 x average legionaries (30,000 men. Probably a mixed bag but treated as legions. 1 x levy heavy infantry (6,000 men. Numidians). 1 x levy light infantry (6,000 men. Numidians). 2 x African elephants with light infantry support (30 elephants [but treated as if 60 in the rules] and 3000 light infantry). 2 x average heavy cavalry (3,000 horse. Gauls, Germans, Spanish, possibly some more heavily equipped Numidians). 1 x average light cavalry and 2 x levy light cavalry (7,500 Numidians. Some with reins and some without. Some better / more motivated than others). Total: 45,000 infantry, 10,500 cavalry and 30 elephants with a fighting value of 66. 10 x veteran legionaries (15,000 long-serving troops). 3 x average legionaries (9,000 newly recruited for the campaign. There are another two legions guarding the camp which are not counted in these figures). 2 x veteran light infantry (3000 archers, slingers and assorted skirmishers). 2 x veteran heavy cavalry (1500 heavy cavalry. Gauls, Spanish, poss. some Germans, Gaetulians. Includes original cavalry, more recent reinforcements, and deserters). 1 x average commander (Caesar's staff). Total: 27,000 infantry and 1500 cavalry with a fighting value of 74. There was a lovely surprise that came with the postman today - a package from Mr. Hunt, all round good guy and blogger of Dulce et Decorum renown. A couple of weeks ago I mentioned here that an army I'd thought was finished was probably going to need a few extra reinforcements. 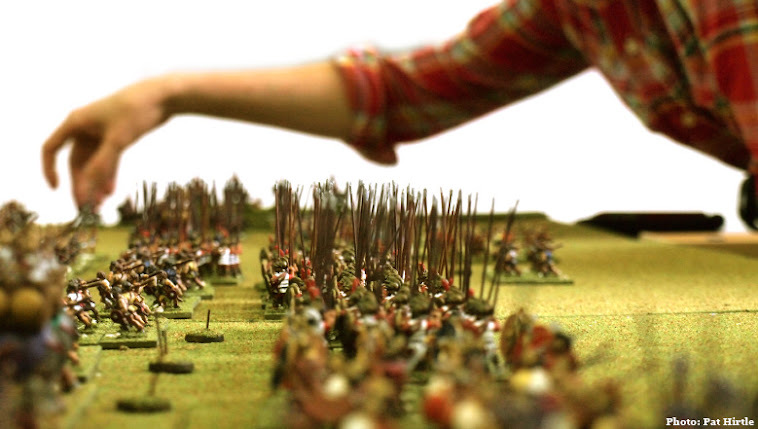 Mr. Hunt very kindly got in touch, asked for my address, and has now sent me some 15mm Saxons to make up the numbers. They are just the ticket: a nice variety of animated poses, and they will work very well as hero figures for my Saxon and Viking armies for Simon Miller's To the Strongest rules. It was a very nice gesture, and I have a feeling that these are going to get a lot of table time. I've been putting together an article and orders of battle for a Thapsus (46BC) scenario recently. Since it's only a playtest I'm using very condensed depth so that I can fit the zones (yes, zones: it's for Lost Battles, of course...) on my little table. In this one Caesar won the battle but lost the game due to the fact that his old nemesis, Titus Labienus, got around one flank and managed to do just enough damage to put the victory points in the Pompeians' favour, 100 points to 91. The Pompeians held out until the very last turn, too: even after a flank has been turned, the camp has been lost and the commander in chief has run away, legions are tough. As a little aside, you'd think that Roman Civil War battles would be dead boring given that they almost always feature the same troop types, that Caesar always has the advantage with his genius for command and his veteran troops, and that everyone knows the battles, etc., but in Lost Battles they are not boring at all. One of the key reasons is that Phil Sabin has a lovely little rule (at first you think it's just an annoying mathematical anomaly) regarding legionary victory points that makes average legionary vs veteran legionary match-ups very tense in big-picture terms. If you read Caesar you see how careful he is with his men. He doesn't want to lose them, put them in situations which might affect their confidence, or fight if their morale is suspect. He wants everything in his favour (how he goes about ensuring that things are in his favour is of course one of the joys of reading Caesar! ), and that little rule in Lost Battles gets the Caesarian player feeling much the same way. Anyway here are a couple of snaps. This one shows the situation after turn two. I've drawn in the zone lines using MS Paint so that it's easier to see who and what is where. In the historical battle Caesar's men rushed Scipio's left flank, panicked the elephants and the Numidian cavalry, and then rolled up the Pompeian line. As you can see in this photo, the attack on the left flank is the main focus at this stage of the battle. This next shot shows the battle at just before the halfway stage. The Pompeian left is still resisting, but the camp is under attack and is about to fall. Labienus is putting genuine pressure on the Caesarian left, and has shattered one of the veteran cavalry units. This success was telling in game terms. In this last picture we see the later stages of the battle. The Caesarians have broken Scipio's left, taken the camp, and forced Scipio himself to flee the field. The Pompeian legions are holding, and with Labienus now attacking the Caesarian flank they are doing some damage. But the Caesarians have superior quality and position and, as they did historically, they will go on to roll up the flank and win the day. So there we go. A successful test and an entertaining battle to engage with. Thanks for reading! Today I saw a thread on The Wargames Website asking how many manufacturers people had bought from and thought that making a list of my own here would be a good post to follow my last. Unlike the TWW thread, I'm including vendors used as well. So that's 13 figure lines brought through 18 vendors. At least two of the vendors have since gone under, but the others are still going strong so far as I know. I do have figures other manufacturers' figures in my collection as well of course, but theysewere picked up in private deals or from B&M shops. I would wager that I use fewer manufacturers than most other wargamers, but the ones I do use I tend to go back to for more! The other week someone on the Society of Ancients forum posted that there was a half price sale on Xyston figures about to start at North Star Miniatures in the UK. I can always find a use for a few extra packs of Xyston, so I thought I'd look and see what they had in stock. They did in fact have some things that would come in useful and I put in a small order for seven packs. About thirty minutes later an email arrived for me from the owner, Nick, apologizing and saying that three or four of the packs I'd wanted had sold out, and asking whether I would like a refund or to pick some replacement packs to throw in. I replied saying that I was sorry to have caused such a lot of hassle on such a small order and for him to just make up the numbers with any Macedonians, Persians or Gauls he still had in stock. He said it was no trouble at all and that he'd do so. Next day there was message saying that the package had been dispatched. The box arrived today, and I've found that not only did Nick seem to have known my mind better than I did myself regarding which make-up packs to choose, but he'd also thrown in a bonus pack of figures for good measure. It was a great interaction all round, from the email pleasantries through to the fast service, the discounted VAT, the very reasonable shipping cost and his throwing in the extra pack (which went above and beyond the call of duty). It was very much appreciated, and I'd certainly recommend Nick at North Star both for his excellent service and also for being one of the many nice people we are lucky enough to have in this hobby.